Some people may sing that a pirate’s life is for them, but as a weathered captain on the high seas, you know how hard a pirate’s life can really be. There’s all the plundering. The constant fear you may be the next one to walk the plank. The parrot food. The seasickness. Plus, everyone is always trying to steal your loot! We can’t help you with the parrot, but we can make sure you are fully prepared for your next great adventure by arming you with a Toy Pirate Pistol. Sword fights can be so exhausting, and plundering really does take a lot of you; but a raised eyebrow and a slow moving aside of your jacket to reveal this realistic gun solves many pirate problems, without you having to overexert yourself. This gun was the perfect accessory for my costume and was of excellent quality for the price. I'd recommend removal of the orange cap, as it's really unnecessary for the pistol. Also have some silver permanent marker for any scratch repairs. 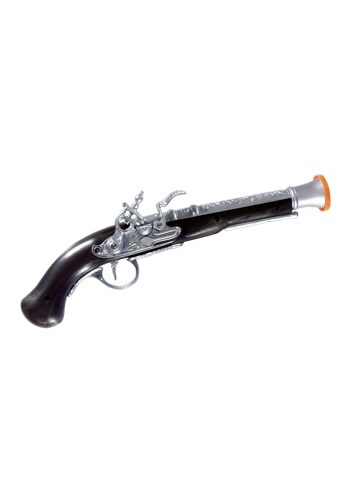 This is a fun toy to add to your pirate costume. I got 2 for my Jack Sparrow costume. You can draw back the hammer of the gun and release it with the trigger. It doesn't make any noises and it is not a water pistol or anything, but it is still a nice toy/accessory. Great quality! The toy actually has some weight so it's sturdy. This was better looking than the gun at the local party stores selling costumes.